Hundreds of Hindu activists have been arrested, teargassed and caned for requesting their basic rights as citizens of Malaysia on 25th November. Around 5000 Hindus of Indian Origin marched towards the British Embassy demanding compensation for forcing their ancestors to Malaysia as indentured laborers. They were waving Malaysian Flags and carried posters of Mahatma Gandhi. 8% of Malaysians of of Indian origin. The Indian Government didn't express a word of dissent against the Malaysian Government for forcing Hindus as second rate citizens. Ethnic Malaysian Chinese are helped by the Chinese and Singaporean Governments while Christians are helped by the US, UK, Australia and other Western countries. What about Hindus ?? Entire south east Asia was ruled by Hindu kings until they were crushed by the brutal Muslim onslaught in the 13th and 14th centuries. Now, Hindus have become second rate citizens and have lost all basic rights as the Malaysian independent courts are not competent enough and the parallel Sharia courts are against Hindus. It is strange to note that Hindus have knocked the doors of Malaysia's erstwhile colonial rulers, the British instead of India. They are sure that they would face the same fate as the Hindus of Uganda who were forced and butchered by the army of Idi Amin. The Indian Government then turned a blind eye while the British were generous enough to take in the immigrants. The same thing happened in Fiji where the ethnic Indian Government (43.4% of Fijians of of Indian origin) was overthrown by the Army and India just didn't even muttered a word of protest. What is that, that is holding back the Indian Governments since Independence not to speak, leave alone fight, for the rights of ethnic Indian citizens in other countries ?? The only one reason I find is Secularism !! Indian secularism prevents South Block to go vocal on injustices meted out to Indian-origin people if they happen to be Hindus. Only Muslim sensibilities are deemed fit to be entertained by Indian envoys abroad. This message further emboldens the Jihadi intolerant rulers to take Hindus in their country for granted as a forlorn people for whom none would bother. While majority of the countries (mostly Muslim countries) give preference to the majority community (Malaysia with their Bhumiputra policy), in India, it is the opposite. Our hands are tied by our Secular Constitution. Indians are secular because it is a Hindu majority country. It is time we change this forever and give equal opportunity to everyone - including Hindus !! Taslima Nasreen - In the news, Again !! This is the second time that Taslima Nasreen was in the news in the past 4 months. It was on 9th August that she was physically assaulted by Muslim fundamentalists in South Indian city of Hyderabad. Check my earlier post on the same - Taslima Nasreen Attacked. She is back in the news when some Muslim extremists have taken out a march in the East Indian city of Kolkata on 21st November, where she is living under the protection of the Marxist state government. The march took violent turn and protesters started pelting stones and torched buses and private vehicles. The Army and Rapid Action Force had to be called in to force peace. 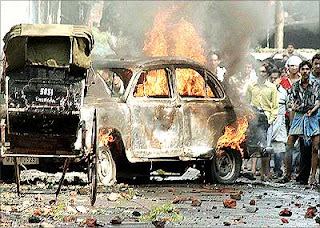 Curfew had to be promulgated in all the Muslim areas of Kolkata. The Marxist under pressure had secretly moved her to the West Indian city of Jaipur and from where she is shifted today (23rd November) to New Delhi. The way the Communist Government had acted led to wide spread protests from left wing poets and rights groups. The government had caved in to the pressure of extremist groups - or is it an appeasement of minorities as is rampant with so called "Secular" politicians throughout the country ?? Why are the minorities so restive and not ready to think broadly ?? It is hightime they come out of their cocoonsand realize how fast the world is changing outside. As dirty as it sound, the politics in Karnataka have proved once again that politics is played in dirt. The Bharatiya Janata Party resigned after losing the Confidence of the house as they couldn't cobble up the required strength on the floor of the house. Main culprit is their coalition partner, the Janata Dal (Secular) which refused to vote in favour of the BJP government. As I am writing this post, the Central Government had imposed President's Rule in the state of Karnataka and kept the Assembly in Suspended Animation (which means that it can be activated as and when any coalition tries to form a government). One reason is that key portfolios like Mining, Urban Development are retained by the BJP. The JD(S) considers these portfolios as "lucrative" and wanted these portfolios to be given to their ministers. Second and most important reason is the Family Politics. Till now, Mr. Kumaraswamy was the Chief Minister. Kumaraswamy is the youngest of the four sons of former Prime Minister and JD(S) President, Mr. Deve Gowda. Now, his other son and Minister, Revanna wanted to enjoy the fruits and wanted to see himself in the seat of CM instead of BJP. From the beginning, he was against a tie up with BJP. His wife, Ms. Bhavani would soon join the party and contest from KR Pet constituency in Mandya District. Now, Deve Gowda wants to make Revenna as CM with the help of Congress Party. Hectic parleys going on in New Delhi between the leaders of JD (S) and Congress. Sources also said if Gowda had let Yeddyurappa continue in office, it could have been fatal for the JD-S in the next elections. Yeddyurappa had gathered huge public support after he, as finance minister, presented a budget where he provided loans to farmers at four per cent interest, waived of loans, banned both arrack and lottery. 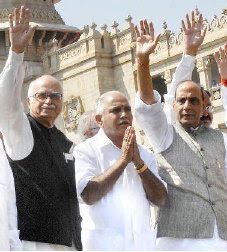 Gowda felt Yeddyurappa may score over the voter through better administration. This time around, the people who have no political ethics should be routed and make them sit at Home and repent for what they have done to the state and its economy. Indian Prime Minister, Dr Manmohan Singh had a two hour one-to-one "secret" meeting with Russian President, Vladimir Putin in Moscow on 12th November. Only the National Security Adviser, Mr. M.K. Narayanan was with the two of them. Singh's visit to Moscow is preceded by Narayanan's much more secretive visit to Moscow in August and that of Defence Minister, Mr. A.K. Antony's discussions with his Russian counterpart in October. There has been a certain amount of concern in Russia following India's closeness towards the Americans, even though they are aware that this collaboration is not against Russia and rather towards containing China. Thing to note is the fact that the American defence industries have been showing keen interest towards India and they are giving specific technological transfer offers to Indian defence industry. For example, the Americans offered India, it's fifth generation aircraft, F-35, which is under development. India is already developing T-90 tanker, Sukhoi Fighter Plane and Brahmos, the Supersonic Cruise Missile, which is one of the world's best cruise missiles. The American offer came after Russia's own offer of co-producing their fifth generation aircraft which would be world's best fighter plane, trouncing America's F-22 Raptor. The deals on the anvil are the production of four nuclear reactors by Russia and also the much awaited sale of the Russian Carrier, Admiral Gorshkov (renamed as INS Vikramaditya). Another important aspect is the "proposed" lease of one of Russians latest nuclear submarines. Neither the Russians nor the Indians are ready to comment on the news that the Submarine had already been deployed by the Indian Navy. It is one of the most advanced nuclear attack submarine which was inducted into the Russian Pacific Fleet this year which is equipped with 28 nuclear tipped cruise missiles. The lease, which may cost India about $650 million, will add a lethal edge to the Indian Navy's fighting abilities; there is speculation that Indian naval officers and sailors are already in Russia in training for this assignment. Why is this sudden rush of acquiring highly sophisticated weapons secretly ?? One reason maybe the situation in Pakistan, which is of a very high concern for the world and particularly India. If Mushraff is toppled, India is concerned about the nuclear weapons falling into the hands of terrorists and the worst case scenario, some mad mullah planning to lob the weapons into India. Time will tell what's cooking !! We can only hope the best out of it. Nandigram SEZ controversy, which caused the Nandigram massacre, started when the West Bengal government decided that the Salim Group of Indonesia would set up a chemical hub under the SEZ policy at Nandigram. The villagers took over the administration of the area and all the roads to the villages were cut off. The administration was directed to break the Bhumi Ucched Protirodh Commitee's (BUPC) resistance at Nandigram and a massive operation with at least 3,000 policemen was launched on March 14, 2007. However, prior information of the impending action had leaked out to the BUPC who amassed a crowd of roughly 2,000 villagers at the entry points into Nandigram with women and children forming the front ranks. In the resulting mayhem, at least 14 people were killed. Few journalists were able to access the area, with their access being restricted by 'checkposts' manned by CPI(M) party cadre; two belonging to a news channel were briefly abducted. Though such a turn of events was not entirely unexpected, the scale of the action left the state stunned. Trinamool Congress estimates put the toll at 50. PWD minister Kshiti Goswami of the RSP, a Left Front constituent, said 50 bodies were taken to hospital, but it was impossible to ascertain how many were actually dead. In response to this, The CPM party has also stated that 2,500 CPM members and supporters and their families were driven out of the area and displaced into relief camps as a result of unrest. It has accused the Jami Raksha Committee - a coalition of activists from various parties who oppose land acquisition - of armed attacks on relief camps which led to three deaths as well as a series of murders and a gangrape. A fresh round of violence came up in November 2007. On November 12, 2007, the National Human Rights Commission has issued a notice to the West Bengal Government directing it to submit a factual report on the conditions prevailing in Nandigram. Communists have once again put up their ugly heads in brutally repressing popular opinion. Since Democracy and Communism go in opposite directions, Communists donot understand nor read people's opinion or thought. If they have planned something, they will do it, come what may. This has proved beyond doubt throughout the history of Communism. I always have a doubt. Does India require Communism ?? Time will tell.